Afghanistan's Rashid Khan appeals for lbw against Ireland's Kevin O'Brien. 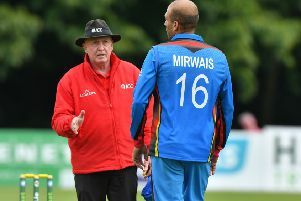 Afghanistan recorded a convincing eight wicket win in the deciding Gulbahar ODI at Stormont on Friday to seal a 2-1 series victory over Ireland. For the first time in the series, Ireland got the chance to bat first, but the theme of them losing early wickets continued when Paul Stirling was caught behind for 2 on what was his 100th ODI. Andrew Balbirnie has been the shining light for Ireland in the opening two games, hitting half-centuries on both occasions, and he was looking in fine touch again at the start of his innings by striking a couple of crisp boundaries. Captain William Porterfield would be next to go after a juggling catch from his opposite number Asghar Afghan gave Aftab Alam his second wicket, and Ireland were struggling at 34-2 after nine overs. It didn’t get any better for the hosts when Gulbadin Naib trapped Niall O’Brien LBW for 1 before he got the in-form Balbirnie to edge one behind to wicketkeeper Mohammad Shahzad for 17. Leg-spinner Rashid Khan enjoys playing against Ireland, and he picked up yet another two wickets when he dismissed Kevin O’Brien and Simi Singh to leave Ireland on 72-6. Khan is only 19, but he is ranked as the second best bowler in this format and is constantly breaking records, becoming the fastest player to 100 ODI wickets (44 matches) and moving to the top of the 2018 ODI wicket-taking charts on Friday. The only thing helping Ireland along was some very poor fielding from Afghanistan, with the visitors uncharacteristically leaking runs with regularity and giving Ireland some much-needed assistance in the run column. They rebuilt through Gary Wilson and Andrew McBrine, with the duo helping Ireland past the 100 mark, but the damage had already been done. Wilson top-scored with 23 before he was one of five LBW victims, and the home side ended a dismal innings on 124 in the 36th over, with Khan ending on 3-18. Afghanistan predictably chased down the target with relative ease inside 24 overs as Ihsanullah Janat ended on 57* and Hashmatullah Shahidi contributed 34*. It is very clear that the wicket was a hard one to bat on, as shown by an individual high-score of 64 throughout the series, but Ireland shouldn’t have struggled as much as they did. James Shannon has spent the series sitting on the sidelines and carrying out 12th man duties, and you can’t help but feel the Northern Knights captain should have been given a go to show what he can do. The 28-year-old looked in fine form in the Twenty20 series against India in June, and although he is recovering from an injury, the Instonians man could have added something and deserves an extended run in the side at some point. It hasn’t been too long since Ireland won nine ODI’s in a row before that run was ended in March, so we shouldn’t be too quick to call for wholesale changes, but having missed out on the 2019 World Cup, now could be a great time to bring in a couple of new faces such as James McCollum and Harry Tector. 2019 is going to be massive for Ireland with a Test match in February against Afghanistan before their third Test against England at Lord’s, and they also face a Twenty20 World Cup qualifying campaign in the latter stages of the year. They are now involved in the ICC Future Tours Programme which guarantees matches against the best teams in the world over the next five years, and it would be highly beneficial if we could expose members of the next generation to the environment.